Peyton will be having surgery to take out her port. Last week at her clinic appointment, I was so excited to see her counts rebounding and to have that proof in my hand that her body was truly recovering from the treatment that I totally forgot to update about her non-fuctioning port. 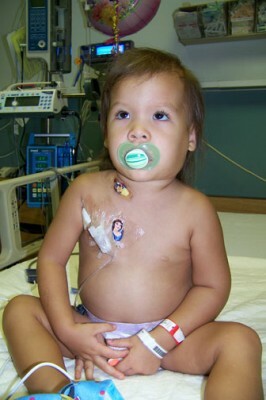 For those that aren’t familiar, a mediport is a cathetar under her skin that has allowed her to have needles stuck into a little round “septum” instead of having to have IV’s in her hands or arms. It’s been the way she’s gotten chemotherapy meds, antibiotics, pain meds, blood products and probably a thousand other things over the course of the past two and half years. It was the first step in her treatment…we’d only known that she had cancer for a few hours before we found out she’d be going into surgery as soon as they filled her with enough blood and platelets to get her through a surgery…to put this strange thing inside her body. Have you sent YOUR toddler off to have foreign objects stuck into their body, Mr. Doctor? Then don’t comfort me on how easy it will be. I could be a tad hostile. I was so monumentally scared to send her off. The fakest smile I’ve ever had on my face. E.V.E.R. I remember seeing her come back with that tape on her chest and that lump of plastic surrounding the needle inbedded in her soft baby skin. The band-aids where they cut into her flesh with their knives. Needles. Knives. In my baby. It was so wrong. We got used to it. She understood the ritual, she was comfortable with the numbing cream put on before they stuck her, she would watch carefully as they performed each step of the procedure…once even telling her nurse, “You need to put your glasses on first, Cindy”…she had a preferred kind of tape and she understood that her “tubie” was important and to be protected. We came to appreciate the port for making the journey easier. (HEH, they were right…whatever!) Peyton doesn’t even remember a time she didn’t have a port…I think she has a hard time believing me that not ever kid out there has one. Certainly, a large number of her friends do…but she’ll figure it out. The port has now stopped working. Kaput! As if it knows it’s time is up and it’s exhausted. But it’s done its job and a part of me is happy to see it go. I thought I’d be more afraid of getting rid of it…never let it be said that cancer moms think rationally. I worried about having to make the decision of when to take it out, can’t we just leave it in forever?…again, with the rational? Not so much. That choice is being taken away now. Because the port is no longer working properly, they can’t flush it out or put meds in it to make sure the cathetar part doesn’t clot, which could be dangerous for her. I met with the surgeon today and we chatted about the simplicity of the procedure…the potential risks…the freedoms that are going to be allowed her when it’s gone…she’s going to be able to participate in gymnastics and sports that have been off-limits. It’ll truly be the last physical tie to her cancer. It’s going to be gone. Me too! I can’t wait to see it gone. I actually want it out. I asked the surgeon if we can have it and he smiled at me, it’s apparently not an unusual request. He said that some have a big celebration and smash it with a hammer or they frame it as a memento of what they’ve survived. I have other plans…prettier plans. I can’t wait to show you….but you’ll have to wait to see. Posted in: adventures at the clinic, chemotherapy, Mayhew niblets, Mom memoirs, Peyton, Peyton treatments, the cancer life. I well and truly love the fact that she no longer needs the port. This? Makes today seem very light indeed!! Me? I’d be all over the hammer ceremony. Smash! Smash! Samsh! Yaaaay! Can’t wait to see what you’re gonna do with it. I am so happy that your are happy that it is coming out. When Evan yanked his feeding tube out and it was decided that it would stay out I was rather upset. I had wanted it to be there for his last surgery but it was not worth the trouble since he was eating on his own finally. I got over it pretty quickly when I realized how much simpler life was with out it. I can’t wait to see what you do with the port. The port coming out is such a big moment. I think it is the finality of it. When Joshua finished chemo it was great. But when the port came out it was like a huge load was lifted from my shoulders. I can’t wait to have that opportunity again. Way to go Peyton! Yeah! I can’t wait to see your plans. Thing 1 went through two ports. The second came out 18 months ago, no issues. The best part is how goofy she got under the sleep meds. She’s a giggler. Best of luck. It’s a sign of progress! So happy to hear that the port is coming out! Are you going to have it bronzed like baby shoes? Do people still do that anymore? The bronzing of the shoes and not the port I mean:) Oooh! Make a plaster mold of it and let Peyton decorate it!! What an amazing day! And I think keeping it is so very fitting, i can’t wait to see what becomes of it! I’m so happy for you girls! You should celebrate with some chocolate! Wow, marvelous news. I can’t imagine everything Peyton (and your family) have endured. This is truly a milestone moment. I’m happy to see that thing go too! I’d be all about taking the hammer to it, but I bet you have a grand idea! I’m interested to hear what you have in store for it. Good riddance! I am so happy for you and her! What a blessing! Here’s to a PORT FREE life for Peyton! WOO-HOO! PS: Your comment MADE my day…..tell your friend I heart her! Can’t wait to see your project Anissa. Wow…you mean they will let you have the old port? That thought of asking them for it didn’t even occur to me. Can’t wait to see what you do with it. I am glad to see it gone. I am glad that it is no longer needed. Sending hugs and more hugs. YIPPEE!!! I felt the same way when Maddie’s PICC line was taken out. This is WAY better!!! Yay for Payton! Oh you guys make me tear up everytime I visit. Congratulations little girl for beating the big bad monster with so much courage. I’m so excited that you will finally be rid of all that goes along with it, and begin to live truly free. Anissa – you are so courageous. You’ve done so much – for your family, for Peyton, for hundreds of other children suffering with disease. You need a medal girl. A big, shiny, chocolate medal.